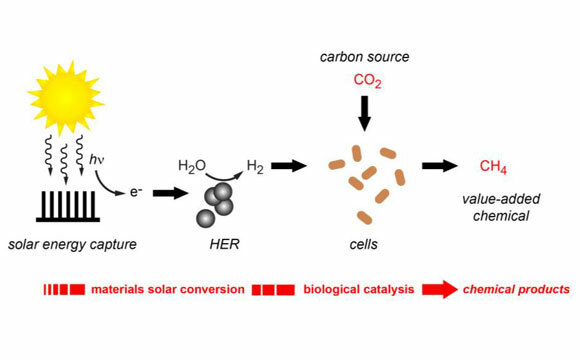 A team of scientists has developed a hybrid artificial photosynthesis system that produces renewable molecular hydrogen and uses it to synthesize carbon dioxide into methane. A team of researchers at the U.S. Department of Energy (DOE)’s Lawrence Berkeley National Laboratory (Berkeley Lab) developing a bioinorganic hybrid approach to artificial photosynthesis have achieved another milestone. Having generated quite a buzz with their hybrid system of semiconducting nanowires and bacteria that used electrons to synthesize carbon dioxide into acetate, the team has now developed a hybrid system that produces renewable molecular hydrogen and uses it to synthesize carbon dioxide into methane, the primary constituent of natural gas. The concept in the two studies is essentially the same – a membrane of semiconductor nanowires that can harness solar energy is populated with bacterium that can feed off this energy and use it to produce a targeted carbon-based chemical. In the new study, the membrane consisted of indium phosphide photocathodes and titanium dioxide photoanodes. Whereas in the first study, the team worked with Sporomusa ovata, an anaerobic bacterium that readily accepts electrons from the surrounding environment to reduce carbon dioxide, in the new study the team populated the membrane with Methanosarcina barkeri, an anaerobic archaeon that reduces carbon dioxide using hydrogen rather than electrons. “Using hydrogen as the energy carrier rather than electrons makes for a much more efficient process as molecular hydrogen, through its chemical bonds, has a much higher density for storing and transporting energy,” says Michelle Chang. In the newest membrane reported by the Berkeley team, solar energy is absorbed and used to generate hydrogen from water via the hydrogen evolution reaction (HER). The HER is catalyzed by earth-abundant nickel sulfide nanoparticles that operate effectively under biologically compatible conditions. Hydrogen produced in the HER is directly utilized by the Methanosarcina barkeri archaeons in the membrane to produce methane. In addition to the corresponding authors, other co-authors of the PNAS paper describing this research were Eva Nichols, Joseph Gallagher, Chong Liu, Yude Su, Joaquin Resasco, Yi Yu and Yujie Sung. Be the first to comment on "Berkeley Lab Uses Solar Energy and Renewable Hydrogen to Produce Methane"